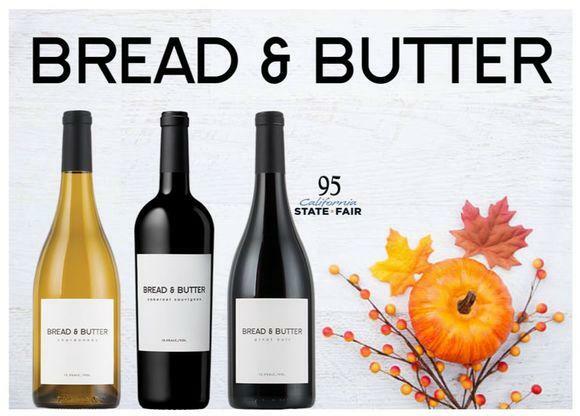 At Bread & Butter, we showcase the celebrated and diverse terroirs of our prized California vineyards in our wines, including our #1 selling, super-premium Pinot Noir. From the morning mists of the Pacific to the fog that rolls in over the hills and the sun-drenched vines over rocky soils, our vineyards benefit from the ideal and natural cool climate for these delicate varietals. This Pinot Noir is all about that cuts the sweetness juicy red fruit. Think cherries and raspberries with a touch of cassis. Delicate hints of cedar, smoke, and bay leaf cut the sweetness of the fruit, a nice balanced bouquet. Let the wine open up to wonderful flavors of peach, lemon zest, papaya, banana, and honeysuckle. Then buttered popcorn and vanilla oak characters emerge from the background to soften the fruit. There is a great balance of acidity and richness that makes Bread & Butter both refreshing and decadent. Elegant and balanced with beautiful black cherry, floral notes on a background of earthiness and spice.